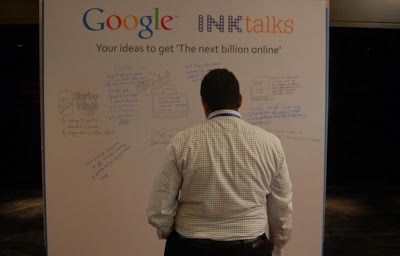 The INK conference happened in Pune last week. 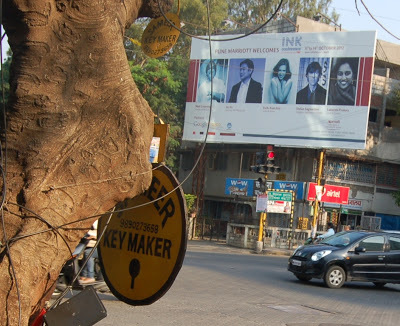 Just outside the conference, was a hoarding, announcing the INK Conference. As I trained the camera on the hoarding, in the corner of my frame I noticed a street entrepreneur’s own billboard :‘Key Maker’, it said. He sat there making keys, for people who had locked their doors and lost their keys! How serendipitously prophetically descriptive! Now do me a favour and throw in a few more adjectives, will you? This was delirium inducing ‘perfect’ metaphorical description that happened by chance. For the INK conference unlocked many doors and shackles in the mind. In several cases the doors where shut firm and keys were lost. But when there is a Key maker around, you get a second chance to open the same silly door! A Key Maker sat outside making keys for real doors. The INK conference did it for doors in the mind. More on this later. Pune was a drive away. The luggage was packed. The excitement was unbridled and flowing despite an uneventful drive on rather inviting roads. If you don’t take into account a lazy cow who on a whim decided to test if the brakes in my car were good enough to merit the EMI, on the Mumbai-Pune expressway. The INK setting was fitting. Taken, as I was by the massive stage, the child like expectation on the faces of fellow participants, that just stopped short of drowning in their own drool, looking at list of speakers who were lined up. And it was an EXPERIENCE. The INK Talks curator and her team seemed to have searched the ends of the horizon to put together an eclectic array of speakers and performers who unleashed an array of emotions, thought and of course plenty of cause to reflect on the life I was living. A week later as I put this post together, I realise that it is hazardous to list any speakers and ideas. For while many I would list, the fear of leaving out a speaker or two and one of those stellar ideas that were shared persuasively, persists. 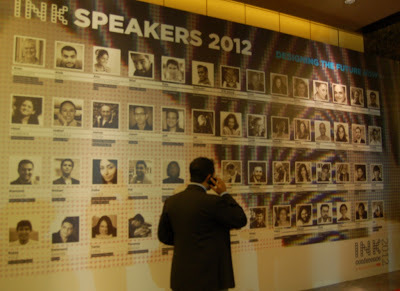 So, heres the disclaimer : This blogpost is no comprehensive list of all speakers. Not by a long shot. 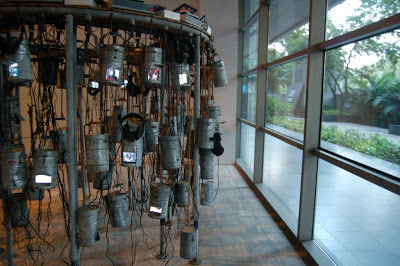 For the INK folks redefined ‘The spectrum’ with their array of speakers. There was a scientist from NASA. Speaking of Curiosity. Speaking from NASA. There was another young man whose fascination was ‘space debris’. (I mean, ‘Space Debris’! This in a day and age, where for many, outer space ends at the gates of a star’s house, I mean a film star! And debris of course, is the neighbours problem! Or for that matter being all of 17 and saying ‘I was passionate about bio-ethanol since I was 11”. When I was 11, other than perhaps collecting ‘photos of cricketers’ wrappers of a chewing gum called Big Fun there wasn’t any much more point to life. Or so I think now. Such young minds holding court with such clarity was large doses of anti-venom to slow poison that seeps in daily just reading the newspapers. If I seem to suggest that it was all about adolescent wizardy, I cant be farther from fact. Take the case of a 76 year old Hindustani Classical Guru whose only passion is to spread the knowledge of music which he wants to stay with generations to come, for which he moved into the house of disciple (herself an accomplished bio-technologist who walked away from all that to be a student of music) to continue the guru-shisya tradition. Speaking of music, have you ever considered whatever happened to all the voices that were part of the Gramaphone era? How bewitchingly fetching is it to note that a set of people are precisely at work with that putting it all together. Or for that matter if I tell you that there were people sobbing hearing a Jamaica based artist perform about the girl child, would you believe me? A dancer that brought alive the story of Thimmakka: a lady who made a difference in her village by just planting trees. A very young architect who creates an amphitheater anywhere in half an hour. A young celebrated photographer who started out life as a rag picker. Ah, now did I make it sound like a very ‘light’ array of topics and entertainment. Hold on. For there was a doctor who operated on a baby several weeks into pregnancy, while the baby was still connected to the mother! I will never ever be able to forget the gut wrenching account by a serial technology entrepreneur about letting go of a loved one. And just as you thought the emotions were getting really kicked on, you had soulful performances. Like the one by Oikyotaan rendering awesome baul songs. And some glued-on-to-your- seat-and-sit-still performances by Vasundhara Das, Joi Barua, Shantanu Moitra, Shruti Hassan and others! Ah, I realise that I am in the dreaded maze that I didn’t want to get into the first place. Of mentioning a few and not mentioning others. For every single person that spoke ( and there were more than 50 of them that spoke), rocked the stage. Its more than a week later. And am getting old. But I cant forget the conceptual clarity of an ex-CEO and celebrated author whose idea of India was arresting as India itself. A current CEO whose organisation is a force to reckon with in the nutrition space. A hacker with high energy. The editor of Wired whose message of having a ‘healthy disregard for the impossible” has shaken the basis of thought and action. A week after the conference. Ideas wafted in the air. Like incense in the Puja room. For instance did you know that Asteroids are full of platinum and one day, we could actually mine them? Yeah, go dig them up and spare the hills in Bellary or wherever? Or did you, for that matter, know that drip irrigation technology was saving millions of litres of water right there in Pune! Or that there could many other ways in refreshing ways in which school curriculum could be designed. Would you think it normal that someone choked on seeing at seeing a picture from her own presentation of the reams of plastic found at the ocean bed? What would you make of a superlatively successful advertising executive who explored the Antartica with the ostensible purpose of conquering fear! But for this conference, I would have thought it to be an outrageous idea that someone even thought of impersonating a guru, founding a religion and make a much awaited film out of it? If that didn’t perk you ear, how about an activists fight to have her film on child trafficking released after directing it and having it as a finished product. Cars that will see. Dresses that can hug (someone else, that is). Phones that are (more) smart. Computers that can impersonate your thought. But, but. That’s not the point. The things that matter are never about the things themselves. But the people that bring them alive. The singers that touch. The artists that stretch the horizon beyond imagination. And the scientists that make the horizon appear infinitely close. Perhaps we could walk away with ‘One moment, One memory and one friend” as what was an eloquently painted goal. That was not to be. You couldn’t go with just one. Be it the moment. Memory. Or friend! And each was a key to a locked door. Suddenly a ton of possibilities emerged about the future. And heres the truth. There are people that go through the motions. There are people that live. And there are people that choose the lives they live. There are plenty of them around the world. When you get to an INK conference, you will see only those that have chosen to live life on their own terms. And it is spectacular. “So, tell me about your conference”, said the missus yesterday over dinner. With a fair sense of trepidation that could match that of ringmaster unlocking the cages of a recalcitrant lion who has a headache! I could tell from her eyes, that she was half expecting me to start a soliloquy. I hate to disappoint her, you know and it culminated in this blogpost. The rest as they say, is history. Even when its about the future. 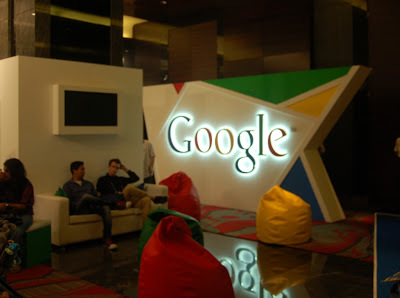 I got to be part of the conference by writing this blogpost on “Designing The Future” as part of this contest organised by the wonderful people at Blogadda & INK Talks. The next year’s conference is in Kochi & there is a 50% discount on till the end of October! All the work that we, at INK, do all year long is worth one heartfelt blog post like this. Kavi! Thanks for taking the time to write this and thanks for making the conference your own. Look forward to seeing you regularly at INKtalks.com 🙂 Warm regards, Lakshmi (Host and Curator of INK conference). I was waiting for this post, Kavi! Sounds like it was an absolutely fascinating conference! It must have been stimulating to listen to” those that have chosen to live life on their own terms”. 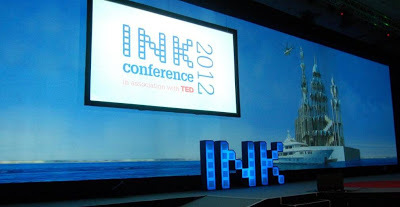 This will act as a reminder that will keep bringing alive the moments experienced at INK2012. Personally, I don’t like calling ‘talks’ at INK as mere ‘talks’, rather I call them ‘Experience Sharing’. well written man! the limited amount I saw live online from home was very motivating, to imagine to “experience” it first hand must be something else entirely. When I saw Kalki video, it reminds me of the word ” third culture kid” who are born and lived in many places as parents traveled a lot with no identity to define themselves. They do a lot of souls searching in case of identity. Good write up and you have a flair for the language. Thanks Kavi for sharing wonderfull memories!!!!!! its like making this whole experience alive… !!!! It was just a dream, pure wonderland, completely unique!!!!!!!!! Good narration of a staged unconventional advertisement, which is what most of these conferences are about. I am not sure about this one though, as I have not attended it. I feel that such conferences should focus on non-commercial ventures that really seek to make a difference in people’s lives. The original TED, for example, comes somewhat close.